10 Rockin' Tips for Happy Grandchildren! The Grandparenting Guide for The Rock-n-Roll Generation provides a refreshing new perspective on the changing roles of grandparenting for today's fast moving, computerized baby boomers. And the chapters are named after hit songs from the past! Totally fun! This adds a unique twist of relating life experiences, challenges and grandparenting advice to the music of "our generation"... often evoking an emotional response within the reader's heart. makes a great gift for family, friends and even yourself. It offers the busy boomer a guide for creating GREAT relationships with "today's" grandchildren while remaining active and contributing to the work force, society and themselves. There's no better time than RIGHT NOW to order . It's a inspiring book that has an entire generation saying "Right on!" Pat's keynote presentations offer her extensive, and first hand, knowledge on life enhancement, leadership, entrepreneurship, successful business building skills, fulfilling your destiny, creating your legacy, philanthropy; and oh yes, grandparenting! In 1986 she began her professional speaking career (she was really, really young). Her ease, comfort and platform experience captivates audiences. And today, when she's not running multimillion dollar businesses, she's still asked to speak in front of huge audiences. No one forgets her message. She is remembered long after the program ends and is asked back time and time again. 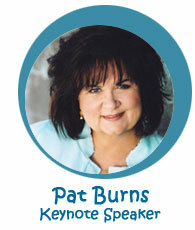 Invite Pat to appear at your next event! "Pat Burns was a hit with my audience. She spoke to the Network for Empowering Women about "vision" and every single woman left her presentation feeling completely inspired, educated and ready to achieve their dreams. Thank you for infusing us all with your knowledge, energy and enthusiasm." "Pat Burns? I could gush for paragraphs - even pages. Here is a boiled down version: Pat Burns is a brilliant woman with zest and passion for life. She's amazing. She is the coordinator for one of most important projects: The Inner Circle. When we first launched this project, we knew that there could not be anyone better to work with us personally to help launch it. She's brilliant." "Pat is a visionary leader that quietly and effectively gets results with speed, finesse, excellence and elegance. We give her a task and know that it will be handle in an omni-effective way. Her skills as a people person are unmatched by anyone. We run a very high end educational business, where individuals are paying us $30,000 each to play and work with us. Pat runs our "Inner Circle" so brilliantly that she makes it look easy and effortless, which is a phenomenal and acculturated skill that is unique to her lifelong working, thinking and soul efforting." "Pat Burns is a mover and shaker in the highest sense of those words. Where she moves old patterns shake loose and new ones emerge. She is a creator of both visions and realities, and she has the energy not only to inspire but to ensure their creation. Follow her and you'll go somewhere. Join her and you'll love where you are going." Buy and start creating GREAT relationships with your grandchildren.